While much of 19th century sociology functionalism and Marxism was focusing on with how social structures, external to the individual, created the individual sense of self (for Marxist’s it is social-class, for functionalists it is functional perquisites) symbolic interactionists said it was individuals themselves. George Mead (1863-31) came up with such an approach. He argued the ‘self‘ is constructed and reconstructed through interactive behaviour – hence the term interactionist. He argued sociologists need to understand the development of the self – the person who you are – and imagine yourself in other social roles. This is a bit like having a conversation with yourself, a sort of role playing. Children do this all the time, role playing, pretending to be in other social situations like playing doctors and nurses -in preparation for growing up. Such a process is termed human agency, how you actively shape the self in relation to how others see you. This is because Mead said the self can only develop through interactions with other people, individuals learn from other people to acquire their own sense of self. Cooley (1998) termed this as the ‘looking glass-self’ – the idea that our image of ourselves is reflected back to us (like a mirror image does) and individuals react accordingly. 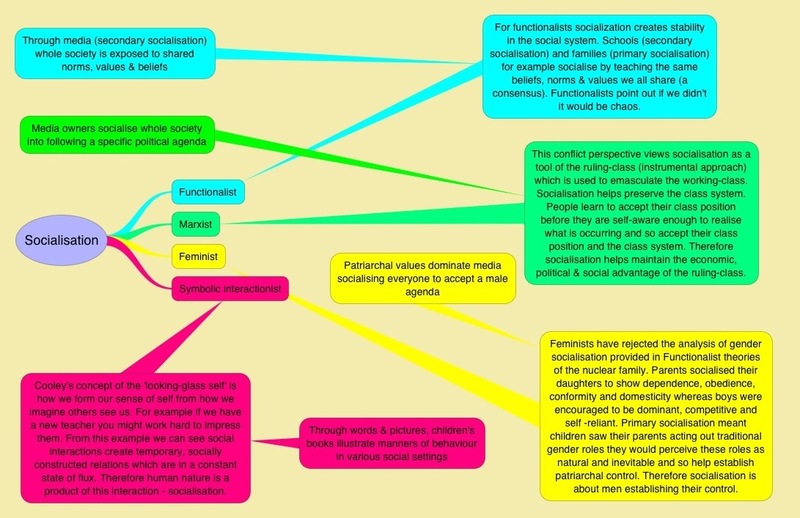 Therefore the process of socialisation can been seen to be actively constructed by our interaction with others (symbolic interactionism) or is seen to be imposed upon us via external stuctures (structuralist approaches such as Marxism, functionalism and feminism). The image below will help you. Alternatively you can follow these links to two lectures on the Self in Society. Lecture 1 and Lecture 2. From the ideas contained in the above it becomes apparent a different type of research method is needed in order to gain understanding of why people interact with people the way they do (think of a student/teacher interaction). 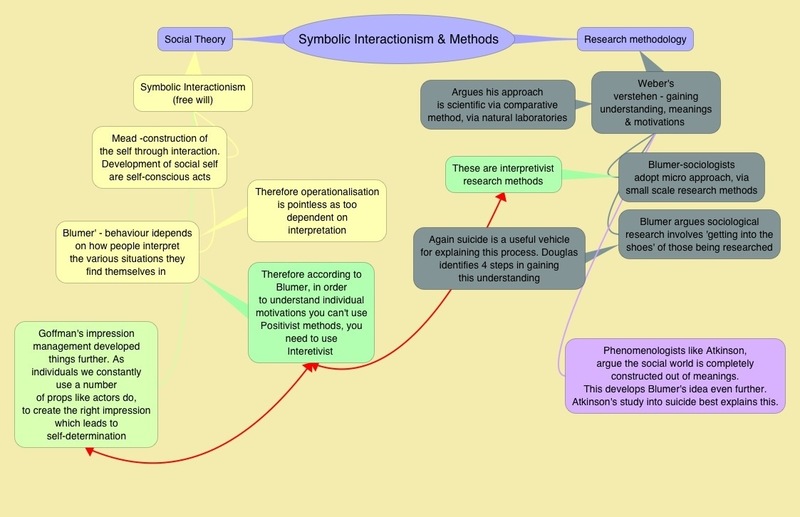 That’s why symbolic interactionists developed an interpretivist research methodology (which are qualitative research methods) from – see image blow – so the sociologist can gain ‘understanding’ about the meanings people give to social situations, something they (symbolic interactionists) say you never get from positivist research methodology (which are quantitative research methods). To explain, the image below illustrates the connection between symbolic interactionism and interpretivist methodology (which uses interpretivist methods, which are qualitative processes eg open interviews). 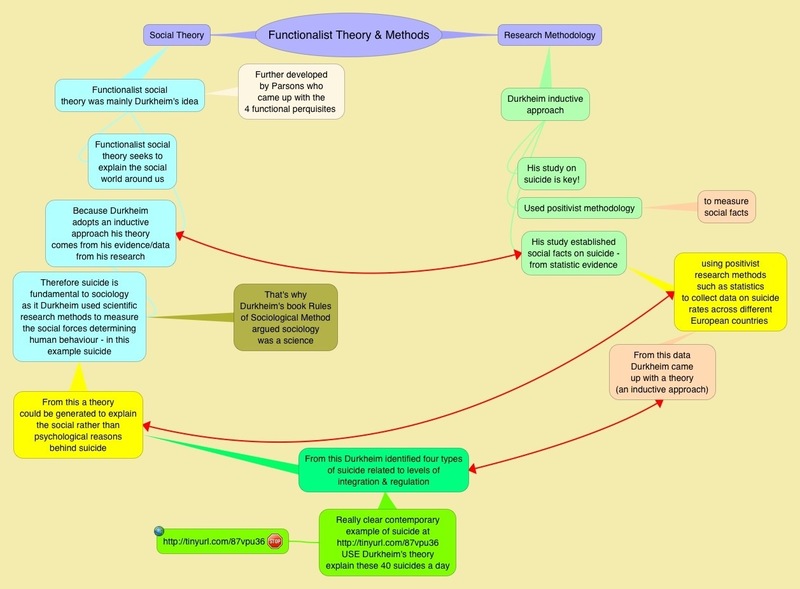 While beneath it, the second image shows the connection between functionalist social theory and positivist methodology (which uses positivist methods, which are quantitative processes eg closed interviews).